Nutritional values: Rich in protein. Boasts the highest content of iron of any food source. Contains all essential amino acids. Excellent source of vitamins A, C, D, and E, calcium, iodine, phosphorus, potassium, magnesium, manganese, vitamins B1 and B2. Culinary uses: Spicy flavor. 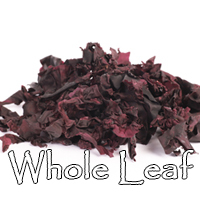 Whole leaf dulse is soft and chewy, with a distinctive taste and a rich red color. It doesn’t require any soaking or cooking. Use raw, dried, toasted, smoked, fried, or baked. Cooks in 5 minutes (use sesame oil) to make feather-light and crispy! Add to sandwiches, omelets, sauces, and gravies. Also add to dressings, salads, soups and chowders, vegetables, potatoes, bean and rice dishes, breads, casseroles and cheeses! For snacking, pan fry and eat as “chips” or try our “Pink Salt” – Dulse mixed with sea salt… which is excellent on popcorn! Nutritional values: Rich in protein, vitamin A, iodine, iron, sodium, phosphorus, magnesium, calcium, copper, sulfur, and antioxidants. 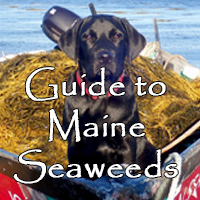 Culinary uses: Irish Moss is the oldest seaweed used in this industry. Long associated with Ireland and Scotland, it is often referred to as carageenan. It has been revered for centuries for its gelling properties. Boil with milk and sugar to release the gelling agent, then cool to form a pudding, sometimes called “Blancmange.” The carageenan extract is used worldwide as a colloidal thickening agent in many foods. Ice cream, toothpaste, instant puddings, jams and jellies all have this ingredient! Beer breweries use it in large volume! Home use is for thickening soups, stews, chowders, gravies, salad dressings, pies, jellies, jams and casseroles! Nutritional values: Of all Maine sea vegetables, Laver is the highest in B complex vitamins, C, E and vegetable protein. 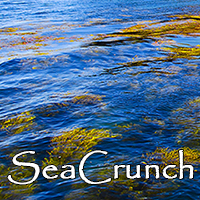 Also rich in calcium, iodine, iron, phosphorus, potassium, manganese, copper, zinc, and vitamins A and K. Large amounts of this seaweed can be enjoyed! Culinary uses: Tremendously versatile! Good in salads, soups, and snacks. Can be eaten right out of the package, soaked or cooked. It is wonderful alongside noodles, grains and vegetables. As an ingredient in soups, stews, casseroles, even pesto! Can be added to desserts for extra depth of flavor and texture. Pairs wonderfully with chocolate and ginger! Nutritional values: One of the highest sources of calcium. Rich in B complex vitamins, vitamins A, C, and K. High in protein, iron, magnesium, iodine, sodium, chromium, zinc, phosphorus, potassium, and dietary fiber. Alaria is almost identical to Japanese wakame biologically and nutritionally. Culinary uses: Excellent for Miso soup and makes calcium-rich vegetables soups, and stews. Imparts a chicken-like flavor when cooked with rice. Whole leaf Alaria can be used uncooked in salads if pre-soaked, marinated in lemon juice, blanched or steamed. Or can be quick roasted and enjoyed as “chips.” Alaria has a more delicate taste but needs a longer cooking time (40 minutes) than the cultivated Japanese wakame (15 minutes). Soak prior to cooking and use the soaking water. Powdered Alaria is a great addition to any energy or protein drink that needs mineral fortification (particularly calcium). Nutritional values: This Kelp contains more mannitol, which is a natural sugar molecule that gives this kelp a milder taste. Kombu has been considered a health food in Asia. Contains abundant levels of iodine, so consume small to moderate quantities. Rich in protein, vitamins A, B, C, D, E, and K, calcium, carotene, potassium, iron, zinc, magnesium, phosphorus, and germanium (a powerful skin healing nutrient). Culinary uses: Kombu is the essential ingredient in Dashi broth and can be used to enhance the flavor of almost any dish. Kombu contain sodium glutamate, often referred to as “natural MSG.” Use dried, fresh, roasted, pan fried, pickled, boiled, marinated and candied. 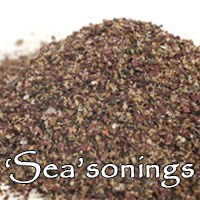 Use in sauces, marinades and salad dressings. Mix with seasonings for a great “rub” for your meats. Cook with other vegetables, rice, beans and grains. If added to beans it will help make them more digestible. Makes an excellent fish wrap for baking and steaming. 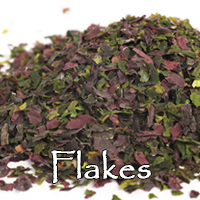 Also beautiful for soup stocks, marinades and seasonings. Used for baking in biscuits, cakes, tarts and cookies. Don’t wipe off the white residue that often appears on the surface, it’s precipitated salts and sugars and is full of flavor! Nutritional Values: Packed with vitamin K, vitamin C, protein, iodine, bromine and phosphorus. It is also very high in magnesium. 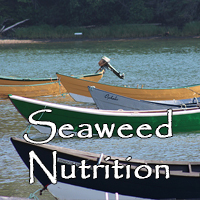 A very balanced seaweed in vitamins, minerals, and trace elements. Culinary uses: Not a traditional culinary sea vegetable, bladderwrack can be used as tea, broth, and seafood flavoring. The tips can be marinated with butter, lightly steamed, and eaten in salads. Use as a base to steam and flavor fish. Delicious as part of a condiment mix. Makes great stock. **Best use is in body care products and supplements. Nutritional values: Has a fully-balanced complement of vitamins, minerals, amino acids, and trace elements! Culinary uses: The main ingredient for a delicious Maine lobster/clambake! 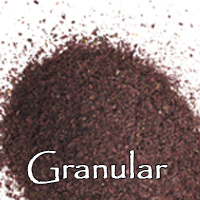 Can be used as a powder in drinks, teas or supplements. Bitter tasting! **Traditionally used in animal feed supplements. Also used for an excellent soil conditioner! Nutritional values: Very high in iron, protein, iodine, aluminum, manganese, vitamin B12, calcium, vitamins A, B, C and nickel. High in dietary fiber (31%)! Culinary uses: Eat fresh with lemon juice or chopped in a green salad. Excellent in stir fries. Delicious in omelets. Can be added to breads such as focaccia. 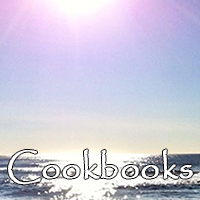 Cook with fish or in meaty casseroles. Unexpected vibrant taste when compared to the mildness of land lettuce.